Putnam pitcher Nick Geertsen kept St. Helens' batters guessing Tuesday night — and the Lions guessed wrong more often than they guessed right. Geertsen tossed a three-hit shutout with no walks and seven strikeouts, leading the Kingsmen to an 8-0 home win over the Lions to open Northwest Oregon Conference play at Rex Putnam High School in Milwaukie. Sam Sholty's two-run single helped to highlight an eight-run first inning for Putnam, and then Geertsen took care of the rest as the junior right-hander recorded his second shutout and third complete game in four starts to open the season for the Kingsmen (6-3, 1-0 NWOC). "First league win, we'll take it," Putnam coach Chad McGowan said. "Nick Geertsen on the hill was awesome. He was pretty dialed in, mixing his speeds up really well, which kept them off balance and got them out on their front foot a little bit. "He's throwing strikes and pounding the zone. He's throwing all three pitches — fastball, curveball, and change — for strikes, and his change has been a great out pitch for him, so far. Just a nasty pitch right now. I hope it stays that way." In four starts, Geertsen with a has thrown a total of 26 innings and allowed five runs (four earned) on 23 hits with three walks and 29 strikeouts. He also is 4-0 with a 1.08 ERA. Against the Lions (1-8, 0-1), Geertsen was the picture of efficiency as he threw 77 pitches, including 55 for strikes. He also threw first-pitch strikes to 17 of the 24 batters he faced. "All my off-speed stuff was working," Geertsenn said. "I was working a lot of them early in counts with my off-speed pitches and then kept them guessing the whole time, basically." Geertsen surrendered a leadoff double to St. Helens' Jacobi Allen to start the game, but then retired the next 14 batters in a row before Trevor Fitzgerald singled up the middle with two outs in the fifth inning for the Lions' second hit of the game. Kaleb Beatty had St. Helens' only other hit — a two-out single to right in the seventh. "I was definitely in a good rhythm," Geertsen said. "I know the only kid I was really thinking about was the leadoff hitter (Allen) because he hit two solid balls against me. Other than that, I felt comfortable throwing to all their hits and just was around the plate. And starting off ahead in counts helped a lot." Of the three St. Helens batters to reach base, two got stranded in scoring position — Allen at third base in the first inning, and Beatty at second base in the seventh. "Geertsen is really good," Lions coach Jeff Timmons said of the Kingsmen's ace. "He's probably one of the better kids in our league. He was an all-leaguer last year and looks to be a first-team kid again this year. "Later in the game, we started sitting a little bit better on some of his breaking stuff, but he got a lot of it across for strikes. We hit five or six balls really hard, too, but right to people. And the ball always takes a good hop when you're playing on turf." The Kingsmen gave Geertsen all the run support he needed in the first inning when they sent 14 batters to the plate and scored eight runs on three hits, six walks, and two St. Helens errors. 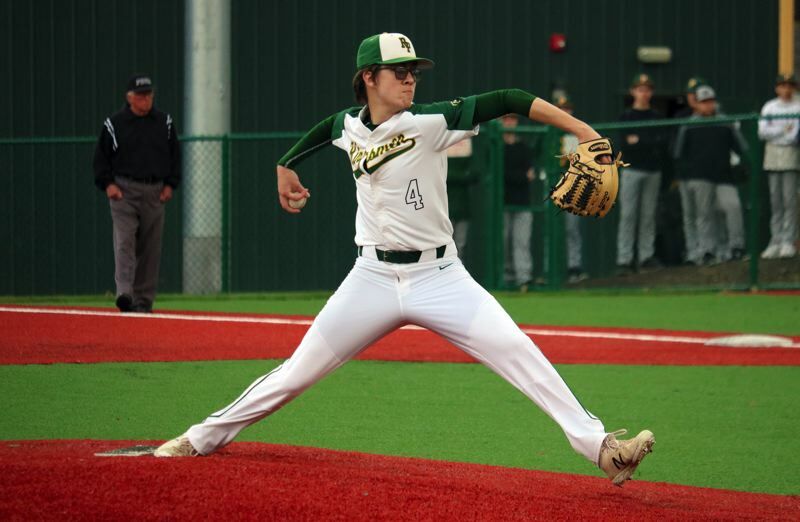 Lions starter Kaleb Edwards, the sophomore right-hander, struggled to find the strike zone and faced 10 batters without recording an out before handing the ball off to Fitzgerald. "Kaleb is better than that," Timmons said. "It's hard for me to say what was happening. It's not like him to miss that badly. Sometimes, your guy just doesn't have it in the first inning, and then we didn't make a couple of plays behind him and … yeah, it was a rough way to start. "I really don't have a No. 1 starter this year, but we have three kids that can throw pretty darn well. Kaleb has been the best so far for us this year, but he kind of got thrown to the wolves today because one of the other starters was out with the flu and the other one missed practice Monday, so I wasn't going to put him in." St. Helens' pitching coach Alan Holinbeck also was missing in action because of illness Tuesday, adding to the first-inning cringe factor. At one point, Timmons wondered in Putnam's newly-installed, artificial-turf pitcher's mound may have added to Edwards' obvious discomfort as he threw a total of 35 pitches — only 12 for strikes. "Our whole field is grass and dirt, and it's a different ball game on grass and dirt," he said. "Sometimes it can get in our head a little bit, but … Kaleb's still an athlete and he should be able to throw strikes. "But, also, we didn't make plays and that makes it hard when you throw a good pitch and get a ground ball and the defense doesn't make the play. That's really rough, especially when you're flailing like we were there at the beginning." Fitzgerald, a freshman right-hander, allowed one inherited runner to score on a bases-loaded walk in the first, but then settled into a groove over 4 2/3 innings, checking the Kingsmen on three hits with one walk and three strikeouts. Garrett Harris worked the final 1 1/3 innings, retiring the four Putnam batters he faced in order. "Obviously, when you dig an eight-run hole you're kind of behind the eight-ball there, but when we play them 0-0 over the final six, I think that gives us confidence moving into tomorrow and Friday."